Mention the words ‘North Ferriby United’ to Tommy Wright and there’s a fair chance it will send a shiver down his spine. 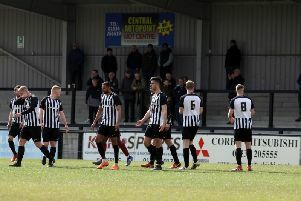 It’s been a tough first season back in the Vanarama National League North for Corby Town so far but there’s no doubt about when the big low point came. The Steelmen travelled to North Ferriby on October 3, aiming to arrest a run of form that had seen them go nine games without a victory. But they found themselves 2-0 down inside six minutes and ended up on the end of a 5-0 hammering. The defeat prompted Wright to unleash his fury publicly as he described his team’s display as “completely unacceptable”. It took them another few weeks to finally halt the poor run when they beat AFC Telford United on November 7 and, since then, they have been embroiled in a fight to survive. North Ferriby, meanwhile, have established themselves in the upper reaches of the table and look well placed to claim a play-off spot. The two teams meet again at Steel Park this weekend and Wright is hoping his players will have a “point to prove” as they bid to get out of the relegation zone. “It was the low point,” the Steelmen boss said. “I thought the lads were well up for that game and I recall we had worked hard on how we were going to contain their threats. “But it was a disastrous day. “The way we started and finished that game was terrible and I certainly made my feelings clear to the players and publicly afterwards. A tough test against North Ferriby comes after the midweek clash at Bradford Park Avenue was called off and is quickly followed by a tough trip to another play-off contender AFC Fylde next Tuesday. This month also sees the Steelmen head to current leaders Solihull Moors while vital games against fellow strugglers Hednesford Town and AFC Telford United are also on the horizon. And that all leads to April when the Steelmen are still likely to need a number of points from their final five matches if they are to avoid the drop. Corby dropped to second-from-bottom in the table following AFC Telford United’s 3-2 win at Alfreton Town on Tuesday night. “There’s a real mix of fixtures for us over the next month,” Wright added. “We have big-hitters like Ferriby and then Fylde next Tuesday as well as Solihull at the end of the month. “In between, we have got huge games against the likes of Telford and Hednesford who are down there with us. “And that will lead us to the last five games, three of which are at home.